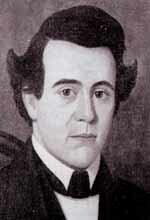 A romantic portrait of Nutt as a young man. From Indianapolis was a stage route forty miles to Putnamville which was the nearest point which could be reached by public conveyance to Greencastle. I left Indianapolis at day break in the morning and arrived at Putnamville at about four, PM. From Putnamville I rode in a wagon that was going out for hay some two miles; the remainder of the distance was three miles which I walked, reaching my journey's end at 12, A.M. on the 16th of May 1837. I found boarding at Brother WK. Cooper's who was a member of the Board of Trustees, a very worthy member of the Church. Here I found a very kind home for six months. The Preparatory Department was to open on the fifth of June and as yet the county seminary building was not ready and would not be, for two months. As the time for the commencement neared, a room in the old town school house, a one story Brick about thirty by twenty was obtained. The West end of this building, long since demolished, was the birth place of the literary department of Indiana Asbury University. On the Day appointed, and announced through the public journals for the opening, I repaired to the room appointed in the delapidated building. Five pupils appeared, barefooted, and without coats; they were boys from town. Some six weeks had passed from the commencement of the Literary Department, when we moved our quarters to the County Seminary building, a twostory Brick about thirty-six feet by twenty. This held us nearly three years. The number of students increased to fifteen before the close of the first term, which ended with an exhibition about the middle of September. By 1839 he was appointed professor of Greek and Latin in the college department and had helped organize the first literary society, the Platonean. After his marriage in 1843 he left the university briefly to enter the pastoral ministry but returned as professor of Greek language and literature from 1846 to 1849. In the latter year he again resigned in order to become president first of Fort Wayne Female College and then of Whitewater College, as well as presiding elder of the Richmond district of the Methodist Church. In 1857 he came back to Indiana Asbury as professor of mathematics and vice president, even serving as acting president for the following year during the interval between the Curry and Bowman administrations. For this latter service he was granted a bonus of $500, which went unpaid for 10 years! 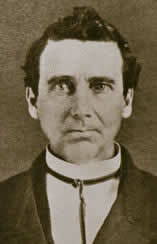 In 1860 Nutt resigned from Indiana Asbury for the last time to accept the presidency of neighboring Indiana University, which he guided successfully through the Civil War years and the following decade. Upon his death in 1875 a special train brought friends and associates from Bloomington to Greencastle for the funeral of the first Indiana Asbury professor and his burial in Forest Hill Cemetery. Descendants continue to enroll at DePauw to this day.